Cooked pasta in a piri piri and tomato dressing with roasted red and yellow peppers and onion, topped with spicy marinated chicken breast. 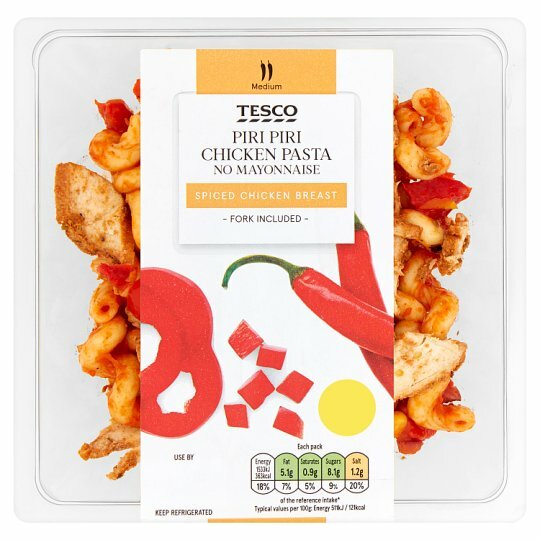 INGREDIENTS: Cooked Pasta [Water, Durum Wheat Semolina], Chicken Breast (12%), Tomato, Onion, Roasted Red Peppers, Sweetcorn, Yellow Pepper, Red Pepper, Water, Red Wine Vinegar, Cornflour, Sugar, Rapeseed Oil, Red Chilli Purée, Salt, Concentrated Lemon Juice, Smoked Paprika, Cayenne Pepper, Garlic Purée, Spices, Herbs, Garlic, Tomato Powder, Colour (Paprika Extract), Palm Oil. Caution : Although every care has been taken to remove bones, some may remain.